This is the perfect book if you enjoy making your own crafts, moreover, greeting cards. There are delightful ideas on how to make your own cards using all sorts of materials, some you'd never think of using. If you have children whose creativity you want to encourage, you'll get zillions of practical ideas to choose from and learn to make exceptionally personal cards, be they birthday, Christmas, Thank You, wedding and so much more. With all the amazing craft stores around that carry a vast array of craft tools and supplies, you'll constantly be inspired to come up with new ideas. You'll be taken through the steps to making a basic card and on to more challenging creations. Taking their lead, you can run with your own ideas and come up with amazing designs of your own, some so simple you'll wonder why you never thought of it before. I've always looked longingly at craft sections in stores, thinking, "I wish I was creative", not knowing which "craft" I could manage. I feel confident I can manage several of these projects and produce a resonable result. I loved the Red and Silver Heart idea on page 41, the embossed card on page 49, and the Poinsettia card on page 81. There's even a collage section and an envelope section. There are also templates at the back of the book as well as paper samples. 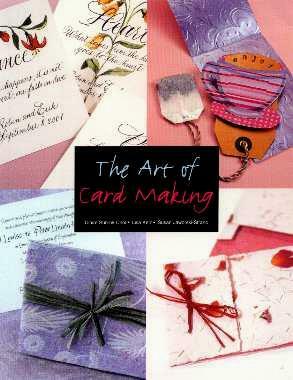 THE ART OF CARD MAKING may be purchased and/or ordered through your local bookstore. Conclusion - Truly inspirational and would make a beautiful gift.